Update your Feeds, Blogrolls, Google Readers, and Subscriptions because I am officially on a self-hosted blog! Health, Happiness, and Hope – http://www.healthhaphope.com! I’ll be keeping this blog open for a few days so everyone can make the switch over, then will be purchasing a redirect to my new blog, so make sure you do the updates to your feeds ASAP! A huge thank you to Matt for helping me get the blog started and putting up with all my “Wait, go slower so I can read through this page” insanity. Matt definitely knows what he’s doing when it comes to self-hosting, setting up a blog, fixing blog meltdowns, and other technological insider details that I have no knowledge in whatsoever. If you’d like Matt to help you out with any of your own blog details for a small fee, give him a shout… he’s an awesome guy, trust me. 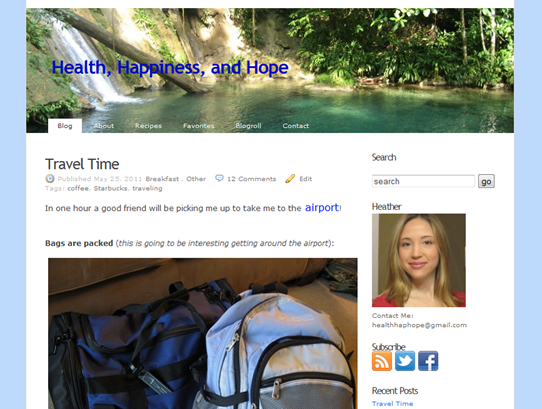 I look forward to seeing you all on my new, self-hosted version of Health, Happiness, and Hope!